Stringer Dimensions – On single chine designs like the Sea Bee and Sea Rider, gunwales are 1 1/2″ X 3/4″. Chines, keel, and deckridge are 1″ X 3/4″. On the Sea Flea, 3/4″ X 3/4″ for all stringers will be adequate, though larger stringer sizes can be used if desired. On the multi-chine Nikumi, gunwales are 1.5 X .75in, Keel and Deckridge are 1 X .75in, and the 6 chines are .75 X .75in. Normally 1″ lumber is milled to 3/4″, but the redwood used on the Sea Bee was 5/8″. If a table saw is available, use it… If not, the following pages illustrate 2 alternative methods that I’ve used on numerous wood kayaks. A circular saw was used to rip the redwood stringers on the Sea Bee ( shown above) and other wood frame kayaks I’ve built. 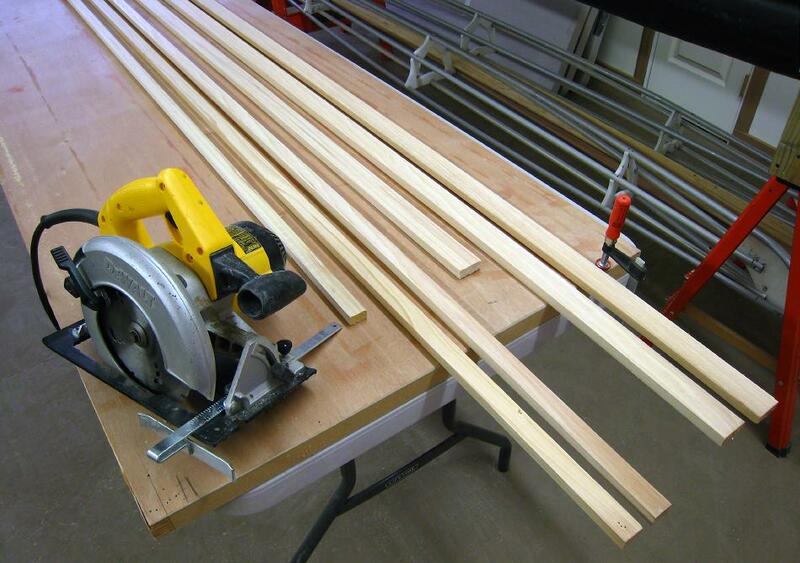 In addition, I’ve ripped 1/4″ (6mm ) strips for the construction of 6 woodstrip kayaks using a circular saw. The cedar stringers of both the Sea Rider and Nikumi were cut using a simple jig saw.